POMEROY — Off-the-clock Overbrook Rehabilitation Center employees took to Pomeroy Parking Lot late Wednesday afternoon to bring awareness to their concerns regarding wage increases. 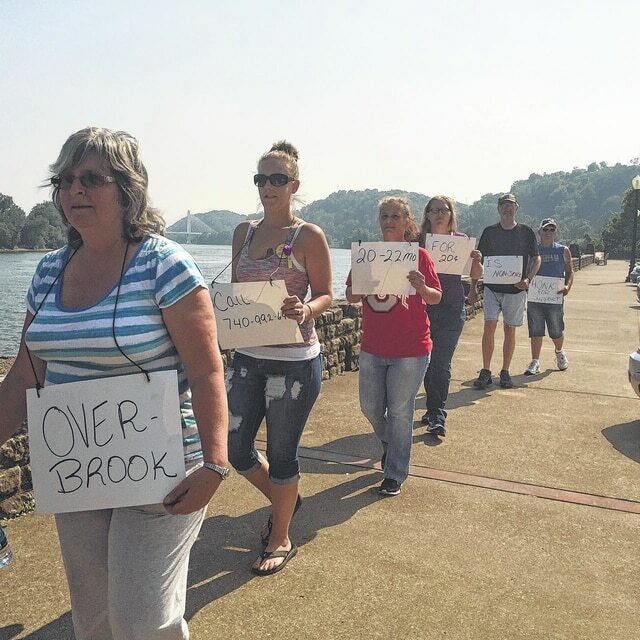 Carol Walters, coordinator for Ohio Healthcare Service Employees International Union District 1199 and spokesperson for the group, said employees decided to do a “human billboard” because employees are negotiating with Overbrook regarding their pay raise. Walters explained that the current contract for employees expires June 30. On July 1, employees will receive a 25–cent increase in pay. The next wage increase will be a 20-cent increase, but this will only be given on an employee’s anniversary, which is 22 months for some Overbook employees. Walters gave an example of an employee whose anniversary falls in May 2015. The anonymous employee would receive the 25-cent raise July 1, but would not be eligible for the 20-cent raise until May 2017 because of their 22-month anniversary date, even if the raise kicked in July 1 of next year as well. According to Walters housekeeping, laundry, dietary and state-tested nursing assistants are the ones who are most affected by the potential 22-month anniversary pay raise. Walters said that negotiations would begin again Thursday morning at 10 a.m. She said Overbrook Rehabilitation Center has been part of a union since 1995. No Overbook officials were available for comment at time of press Wednesday.